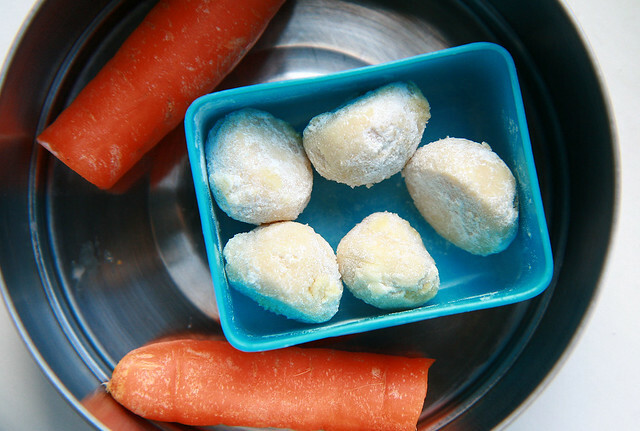 Most days I just dread having to prepare Lil L's packed school lunch in the morning. The girl's a very demanding customer so I have to come up with delicious alternatives other than the standard ham and cheese sandwich which I personally loathe. I've heard many complaints about her cooked lunch in school. The cook forgot to add milk to the mashed potatoes. The veggies are overcooked. The cakes are too sweet. She's turned into a food critic. I thought I'd try making a baguette with chicken filling. It's far healthier than using store bought ham which contains a lot of sodium and packed with preservatives. I'm hopeless at writing recipes as I tend to add a little bit of this and a little bit of that and voila, something that Lil L approved and promptly inhaled during her lunch break. In this case, I'd cut up a few sticks of carrots and included her favorite biscuits, Kuih Momo. 1. Mix the above ingredients all together. Taste and increase seasoning if required. 2. Slice the baguette. Slather both sides with a thin layer of butter so that the filling does not soak into the bread. 3. 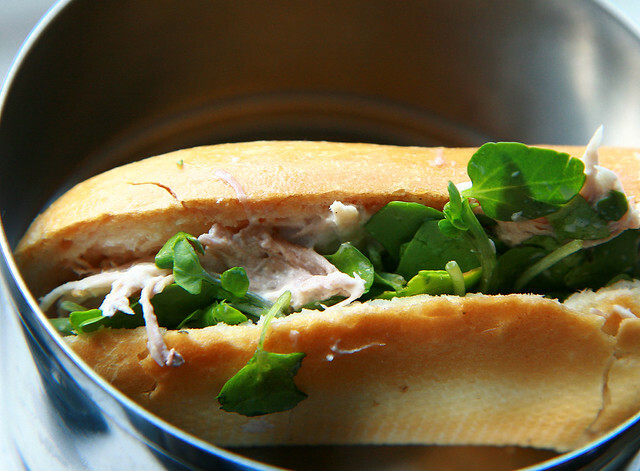 Dump a dollop of the chicken filling and watercress into the baguette. I love her little box lunch! Thanks for sharing! My husband is a picky eater too, so I'm always trying to find healthy and yummy alternatives for him to eat. Chin, Kuih Momo is so darn easy to make. I can't make them fast enough because all my visitors gobble them up. Laura, bet your kids aren't as opinionated as mine! Sam, she's a harsh food critic alright! You can make this in no time at all. I'm all for fast and healthy food. Susan, your husband sounds like me! I'm a far pickier eater compared to Lil L. The baguette only lasts no more than 1.5 days. What I do is get the Delifrance vacuum sealed baguette which can be kept in the pantry for a few months. It contains no preservatives whatsoever. All you need to do is bake it in the oven for an additional 10 minutes and voila, freshly baked baguette. I don't often have time to buy fresh baguette everyday but I try to do so every few days. I eyeball the ingredient list on every packaged item like a hawk. They do tend not to last for more than 3-4 days max if they don't contain any preservatives whatsoever. I do notice that a lot of pre-packaged food from the US have ingredient lists longer than my arm and are full of chemicals that I can't even pronounce. Kim, *HUGS* You're a sweetheart. I'm a foodie so I don't mind experimenting with different cuisines. I have friends who hate cooking with a passion but can sew anything, a skill that sadly I lack. good !! !beautiful blog!!!! i'm following you!! !if you like mine,do the same!!! This is my kind of sandwich - sounds delicous! I think we have the same cooking philosophy - a little of this, a little of that, a lot of prayer that it all turns out edible! - I skipped mustard cuz I forgot to buy the previous night. ZZzz..
- added Chinese parsley cuz I just love it in almost everything. Chicology, the best thing about cooking is you can change it to please your own palette. Glad the hubby likes it. Just found your blog. Very interesting. I love using left-over chicken for sandwiches. I often use warmed pita bread as a vehicle for the filling. I keep them in the freezer. Middle Eastern stores have a good selection, usually 3 packs for a £1 and they have other wraps that make nice sandwiches. Jamie Oliver has a good recipe for chicken salad which uses yogurt and mayo for dressing along with toasted cumin seeds. It also contains cucumber and watercress, plus lemon from memory. Another good tip, if you don't have time to cook a chicken is to go to a Waitrose with a deli counter. They do amazing rotisserie free range chickens for under £5. Re bread - Pain Poilane (also available at Waitrose) is very good at keeping for a few days, and makes good toast and toasted cheese sandwiches. They have a shop in Elizabeth St. in Victoria. I first discovered it in Paris. Thank you for the tips, Cathy! I have a Waitrose within walking distance so I'll definitely check out the items you've recommended.